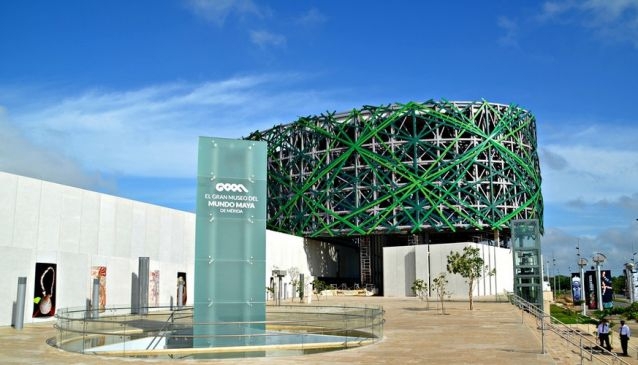 El Gran Museo del Mundo Maya is the newest musem in town, it is located close to the Merida-Progreso highway, so this can be a great stop before you head to the beach! This museum is a celebration and an encounter with the roots of the Mayans and its strongest identity. The museum is divided into six sections: ancient Maya, modern Maya, culture and nature, art and science, society, and world view.They also have a free nightly light-and-sound show at 9pm with images projected on a wall outside. El Gran Museo Del Mundo Maya also features a 'Meteorite room', a space where you can learn about the meteorite that fell in Chicxulub, Yucatan 65 million years ago and wiped out the dinosaurs. There's also a 'Mayamax' movie theater here that screens many documentaries, concerts as well as 2D and 3D movies for kids. If you are staying downtown you can take the public bus on Calle 58 that takes you to the 'Gran Plaza' shopping mall that is just a short walk away from the museum.